The results for the 2019 QS World University Rankings for Anatomy and Physiology are in. 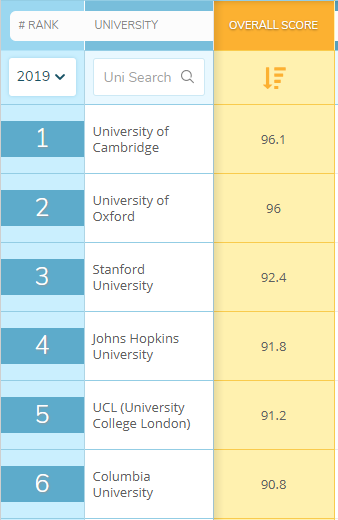 The Head of Department is pleased to note that DPAG is still in a world leading position and would like to congratulate the University of Cambridge in being ranked number one. The figures show close scoring for this year, with Cambridge achieving an overall score of 96.1 and Oxford achieving 96. The Division itself has once again been ranked second in the world, and the University as a whole has been ranked world number one in five other subjects: Anthropology, Archaeology, English Language and Literature, Geography and Pharmacy & Pharmacology.